The newly updated Slide Lite packs the unrivaled versatility of aSlide into a smaller package, perfectly suited for mirrorless and light DSLR cameras. 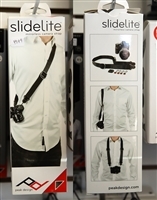 Wear Slide Lite as a sling, neck, or shoulder strap. Seatbelt-style nylon webbing has a smooth side that glides over clothing in sling mode and a grippy side that prevents slipping in shoulder mode. Dual quick-adjusters provide instant access and easy reconfiguration. Unique Anchor Link system connects quickly and dual points of connection keep your camera more stable than traditional sling straps.